The Grand Opera House on Adelaide Street in 1921, view looking west on Adelaide Street. Toronto Archives, F 1231, Item 0843. Unfortunately, the Royal Lyceum burnt in 1874, but the year before, a new company had been created to construct another theatre—The Grand Opera House. It was to be erected at 9-15 Adelaide Street West, a short distance west of Yonge Street. The new venue was to be managed by Mrs. Charlotte Morrison, a retired actress. Its architect was Thomas R. Jackson of New York, who designed the Toronto theatre in the Second Empire style, with Mansard roofs atop its east and west wings, connecting sections, and the tower. The four-story theatre was constructed of brick and stone, with wooden joists to support the interior walls and floors. Its interior was elaborately trimmed, its ornate gas lamps ignited by batteries. On the first floor, facing Adelaide Street, on either side of the theatre’s arched entranceway, were shops that were rented. The floors above the shops contained offices that were also rented. The funds derived from the shops and offices helped defray the expenses of operating the opera house. The theatre’s arched entranceway led patrons into to a plush reception foyer, 50 feet in depth. Beyond it was the main foyer, where the ticket booth and refreshment bars were located. Stairs on the east and west sides of the foyer allowed patrons to ascend to the dress circle and the two balconies, similar to the Royal Alexandra Theatre of today. The theatre’s domed auditorium accommodated 1323 patrons. On the main floor (orchestra section) and in the balconies, people sat on chairs that folded to allow access to the other seats in the row. This was a new feature not yet common in Toronto. The stage was of sufficient size to allow large-scale productions, as it was 53 feet wide and 65 feet deep. In front of the stage was a sunken orchestra pit. The building was steam heated. The Grand Opera House opened on September 21, 1874 with a gala that attracted the elite of the city. The evening’s feature performance was Richard Sheridan’s 18th-century comedy, “School for Scandal,” with the theatre’s manager, Mrs. Charlotte Morrison in the role of Lady Teazle. When the opera house held grand balls, the seats in the orchestra section were covered with a wooden temporary floor to allow people to dance the night away within the magnificent theatre. However, despite it being well attended, critically acclaimed, and highly popular, the theatre was not a financial success. In 1876, it was sold in an auction to Alexander Manning. Three years later, the building was badly damaged by fire. The exterior walls had not been damaged, but the interior was gutted. Manning hired the architectural firm of Lalor and Martin, and it was rebuilt in a mere 51 days. The new architects’ designs were faithful to the original plans, except that the seating was increased to 1750. The grand reopening occurred on February 9, 1880 with a production of Shakespeare’s “Romeo and Juliet.”During the years, famous actors who were on its stage included Maurice Barrymore (father of Lionel and Ethel) and Sarah Bernhardt. For the next two decades, Toronto’s theatre scene focused on the Grand Opera House. In 1919, Ambrose Small, the theatre’s manager, disappeared along with a considerable amount of cash. His body was never found and the case remained unsolved. During the early years of the 20th century, its importance diminished due to competition from the Royal Alexandra and the Princess Theatres on King Street. Finally. the Grand Opera House was closed and it was demolished in 1927. 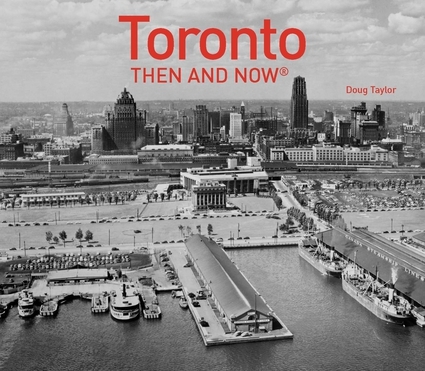 Sources: urbantoronto.ca—torontohistory.net—”Lost Toronto” by William Dendy. Site of the Grand Opera House on Adelaide Street, between Yonge and Bay Streets.